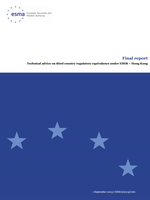 MEMOFIN - Guidelines on the exemption for market making activities and primary market operations under Regulation 236-2012 of the European Parliament and the Council on short selling and certain aspects of Credit Default Swaps - L'information financière que vous ne trouvez nulle part ailleurs ! The Regulation (EU) No 236/2012 of the European Parliament and of the Council of 14 March on short selling and certain aspects of credit default swaps (Regulation) is applicable since 1 November 2012. The Regulation provides for exemptions of market making activities and activities carried out by primary dealers which allow relevant entities to build short positions without being obliged to notify the relevant competent authority or to locate the financial instruments in case of short sales or to enter into uncovered sovereign CDS transactions without infringing the prohibitions set forth in the Regulation. After the finalisation of work on the mandated implementing measures, ESMA has launched on its own initiative work on the concept of market making activities as provided for in the Regulation in order to foster supervisory convergence in the field and agree on a common approach towards application of the exemption.